In Desecration Finale, one of t.Rutt’s most provocative artworks, the artists sewed Trump’s hot mic comment (Grab ’em by the…) onto the American flag and carried it to Trump rallies, early voting stations and protests. Facing the U.S. we ask . . . 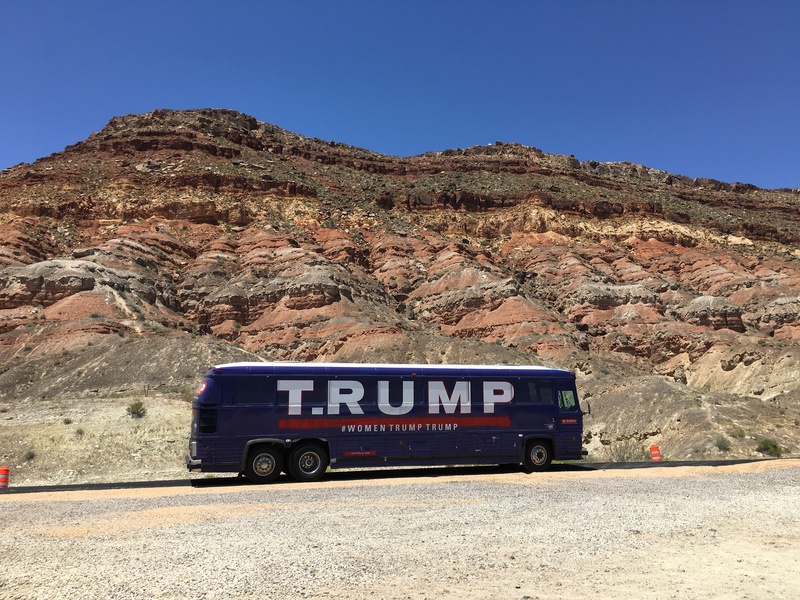 Working under the name t.Rutt, artists David Gleeson and Mary Mihelic bought Donald Trump’s campaign bus when it went up for sale on Craigslist last Fall. 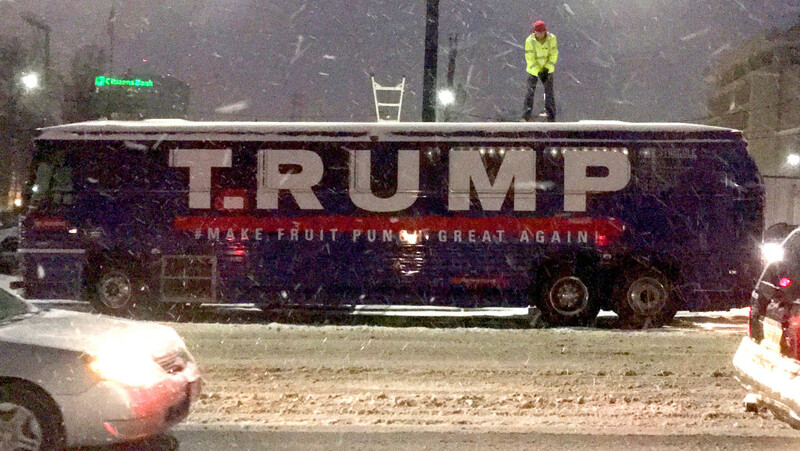 Gleeson and Mihelic have transformed the bus into an anti-Trump contemporary artwork that is traveling the country. All the original Trump campaign artwork remains on the bus but it has been artistically altered and transformed into the T.RUMP Bus. In early September we went back to Jacumba Hot Springs, CA to build our second section of Trump’s Wall which we call American Vetting Wall. We were baffled to see that our first section of Trump Wall had completely disappeared without a trace. (See the original image below). We used cinder blocks, old ladders and rope to critique Trump’s fantastical idea that he’d deport 11 million Mexicans and then “let the good ones back in.” (On the side facing Mexico the text art reads, “Are you nice? Si or no.”) Hanging from the top ladder are makeshift booties made from scraps of Mexican blankets and twine that we found in the shrubs near the existing fence. The U. S. Border Patrol rakes a 40 foot wide smooth strip of dirt along the fence with old tires – to track the footprints of those who jump the fence from Mexico. 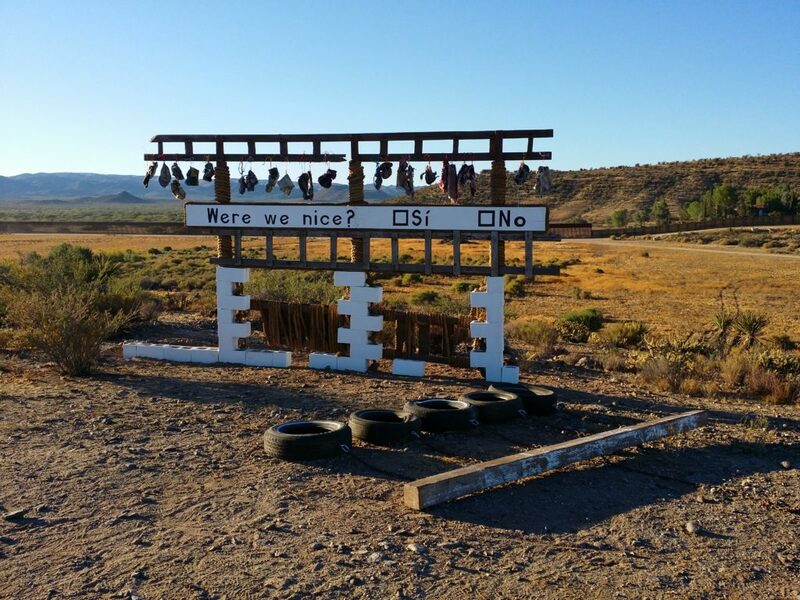 The booties minimize the footprints and tracks made by the shoes of those hopping the fence. We liked finding booties in the landscape. They are colorful relics of the desire, determination and industriousness of those who risk it all to enter the U.S. in search of a better life. 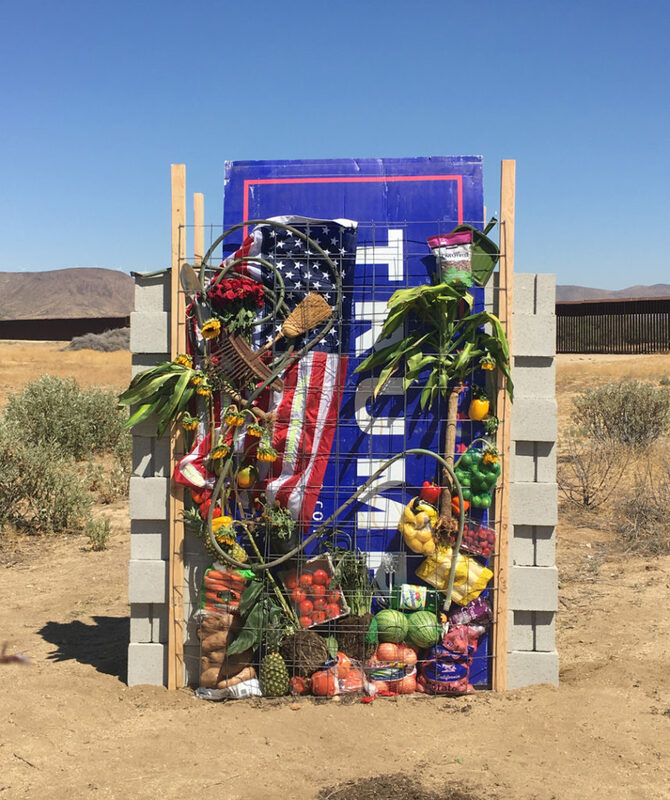 In July we had built the first section of Trump’s wall (image above) on the U.S./Mexico border in Jacumba, CA and sent the bill to the President of Mexico. The artwork referenced what would happen to the U.S. agricultural, flower and service industries it Trump deported 11 million Mexicans. Read the full story in The New York Times. The artwork on and inside the T.RUMP Bus has evolved as an artistic rebuke against Trump’s divisive, xenophobic and misogynistic campaign rhetoric. Our artwork on the bus has also addressed issues ranging from the worries about Trump’s potential fascism to the sophomoric dialogue about the size of Mr. Trump’s hands. We are finding that our artwork around the T.RUMP Bus often probes the psychological and emotional state of Mr. Trump, including his reliability as a potential leader of United States. We have driven the T.RUMP Bus through over 40 states. 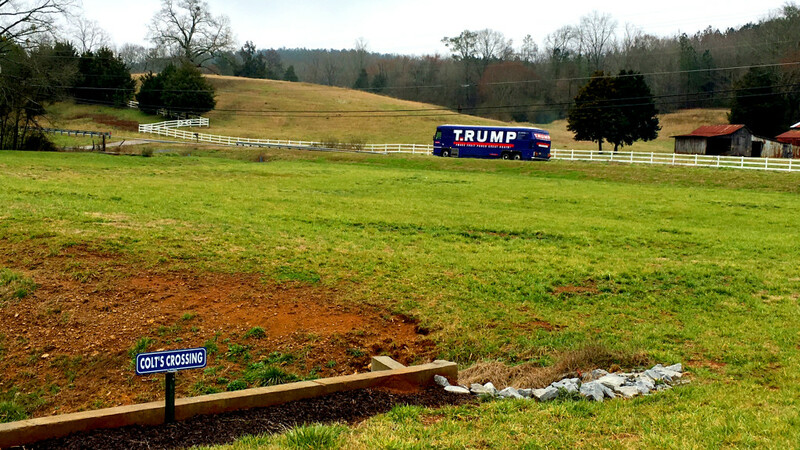 As we drove around the country, we pulled off in small towns and engaged with the public about Donald Trump. 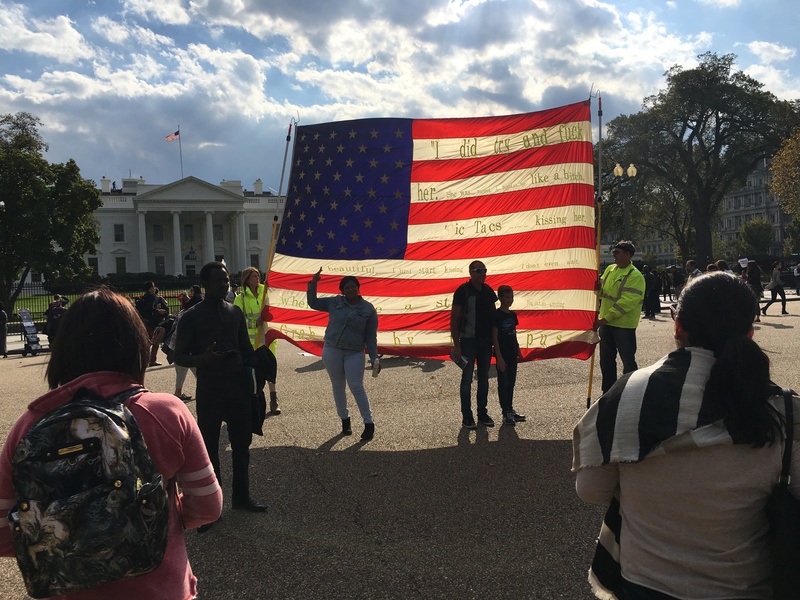 We also hit Trump rallies, Clinton and Sanders events, and more.